On March 25, 2019, in the premises of the Bank of Albania, was launched the 2019 Week of Money, during which various educational activities for students and students will be organized. This Week is a world-wide celebration of money, which aims at raising the awareness of the young generation to be accountable citizens in the future and able to make well-informed financial decisions. This is the sixth year that the Bank of Albania and the Albanian Association of Banks, with the support of the Ministry of Education, Sports and Youth, as well as other partners, are part of this celebration, aiming to always offer a more interesting program appealing to involving a large number of students and students in educational activities. At the core of these activities lies financial education, more specifically how they care about money, how to save, how to earn income through entrepreneurship and lay the foundations for their future. These will be realized through their participation in lectures, competitions, visits to the Museum of the Bank of Albania and in commercial banks and open classes. This year, the Bank of Albania has decided to choose a topic that is related to the history of the Lek reading mistake of the years. 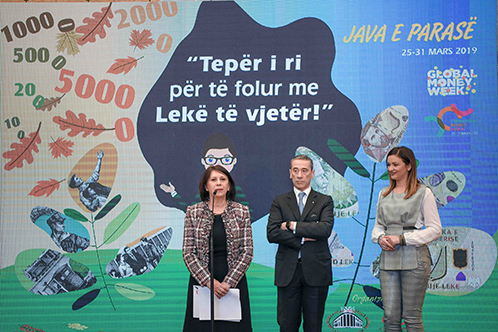 This year’s theme: “Too Much to Talk to Old Lek!” Aims to stretch longer than the Money Week, focusing on educating society on the correct use of the term “lek” in daily financial affairs. The key activity of the Week of 2019 was welcomed by the First Deputy Governor of the Bank of Albania, Luljeta Minxhozi, Deputy Minister of Education, Sports and Youth, Lorena Haxhiu, and Chairman of the Albanian Association of Banks, Silvio Pedrazzi. In her greeting speech, Minxhozi emphasized that 2019 marks the 12th year of Bank of Albania’s involvement in the public financial education effort in general, with a focus on the youngest. She added that this commitment of the Bank of Albania is fully in line with the spirit of transparency towards the public and the raising of her level of awareness on economic and financial issues affecting everyone’s everyday life. In this framework, the Money Week summarizes all our efforts in this area. Ms. Minxhozi also underlined the motto of the activity “Too Much to Talk to Old Lek!”, Addressing a specific issue for our country, such as the misuse of more than 5 decades of “new leks” and “Old lard” in our daily financial relations. At the end of her speech, Minxhozi thanked the participants for the contests, and encouraged them, as part of the younger generation, to always try to speak correctly, helping to break this mischief once and for all. 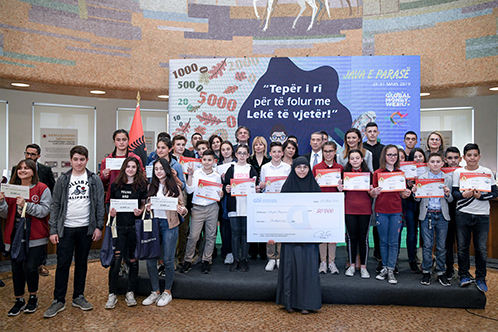 Further on, the event continued with the award ceremony for the winners of three competitions organized by the Bank of Albania and the Albanian Association of Banks on the occasion of the Money Week, with the participation of about 340 students from 40 different 9-year schools and gymnasiums . The first competition organized this week under the theme “Learn. Courses. Fito “and Bank of Albania invited the students of the VI grade of the 9-year schools to participate in their original projects. The second competition was the one with photomontages on the subject: “Too young to talk with old Lek: one more 0 makes the difference”, which was attended by 9th grade students of the 9th grade. While the third organized competition was the one of the best video. The high school students were invited to convey their messages with the originality of the topic: “Too young to talk with old Lek”. The winners of the best essay competition with the themes “Renaming Lek: a socio-linguistic look on a 55-year error” (Branch of Language and Literature) and “Renaming: examples from history and the Albanian case” (Finance-Bank Branch) will be announced during the Money Week.